In the early 2000’s, the “Tuscan” trend was all the rage. Browns, golds and warmer neutrals were the interior look of the moment. Design trends tend to cycle through about every decade. The decade turned, and the new trend became what we call the “Gray” trend. Everything went cooler, more fresh and crisp. Here is where the conflict arises when I receive feedback from my clients. They are either living in or buying a home that is still decorated and painted during the Tuscan era. They want to update the look of their home, but the problem is the expense involved in a complete overhaul of the current selections (countertops, floors, etc.). Since most of my clients are working with what they have or making adjustments gradually, my goal is to help them transition from the Tuscan look to more of a gray. Most people don’t necessarily want to go totally gray, so here is where my top neutral paint colors come in. I know you’ve been dying to know my top 5!! The truth is that there are so many great neutral paint colors that it is hard to choose just 5. 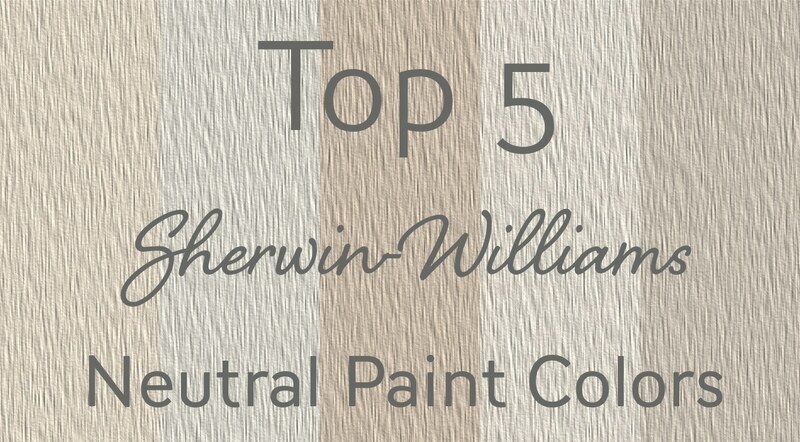 Below are my top 5 most specified go-to neutral paint colors. Be sure to click on the links for the colors to see my color scheme picks for each. Feel free to leave a comment with your top 5 neutral paint colors! Balanced Beige, oh how I love this color. It is by far my most specified color for clients. The reason is really laid out in my description above. It is a perfect transition color. Balanced Beige is not to golden, not too gray. It is a greige that has a taupe undertone that tends to go well with floor tiles and countertops that still have the Tuscan brown tones in it. Basically, it goes more gray without totally clashing with the current selections that are still beige. I love this color so much that I did an entire post and color review on it last year. You can view it HERE. One shade lighter than Balanced Beige, is Accessible Beige. I specify this color if my clients want a softer look and have a space with not very much natural light. Just like Balanced Beige, Accessible Beige is a greige that has taupe undertones and is a favorite in spaces that are in need of an update. 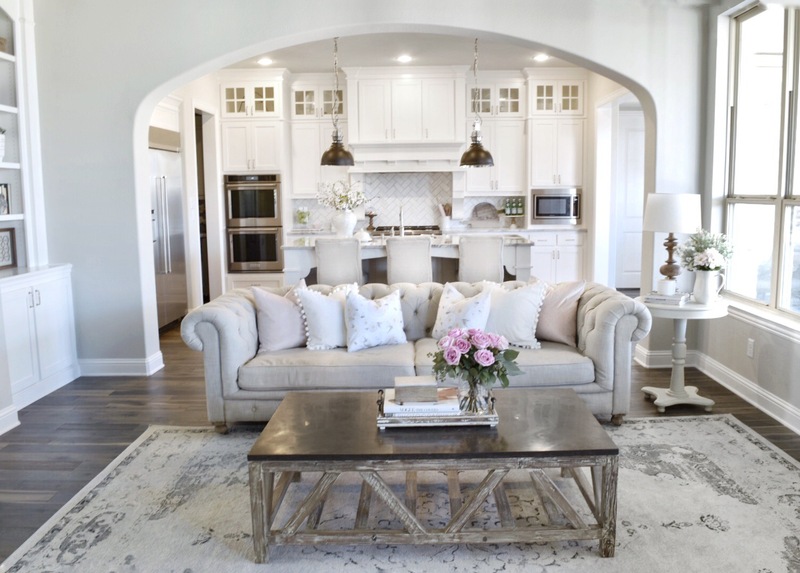 Accessible Beige looks beautiful next to darker furniture pieces (like dark taupe sofas) and is a perfect color for the soft look of the “farmhouse style”. I also like to pair Accessible Beige with accent colors like Smoky Blue for a bit of contrast. For some Accessible Beige inspiration check out my Accessible Beige Mood Board. I have handpicked each selection based on what I believe will work nicely with Accessible Beige in every space. All products are affiliate links. Enjoy! My second fav, is most definitely Agreeable Gray. This is also a top contender for my most specified color. I typically suggest this color to clients that want to go a bit more gray and have selections that have less brown/beige undertones. Agreeable Gray is a bit cooler than Balanced Beige while still being on the warm neutral spectrum. As shown in the picture below, where I specified Agreeable Gray fro a client who was renovating her kitchen. As you can see Agreeable Gray looks gorgeous and is a perfect match with blue-grays and blue-green color combinations. The kitchen island below is Cityscape, which I recommend to pair with neutrals like Agreeable Gray. For some Agreeable Gray inspiration check out my Agreeable Gray Mood Board below. I have handpicked each selection based on what I believe will work nicely with Agreeable Gray in every space. All products are affiliate links. Enjoy! Anew Gray is a beautiful color. I tend to choose Anew Gray when spaces can handle some depth of color with more natural light and higher ceilings. It has warmth, but like it’s lighter shade, Agreeable Gray, is a good transition from golden beige towards a cooler gray/greige color. 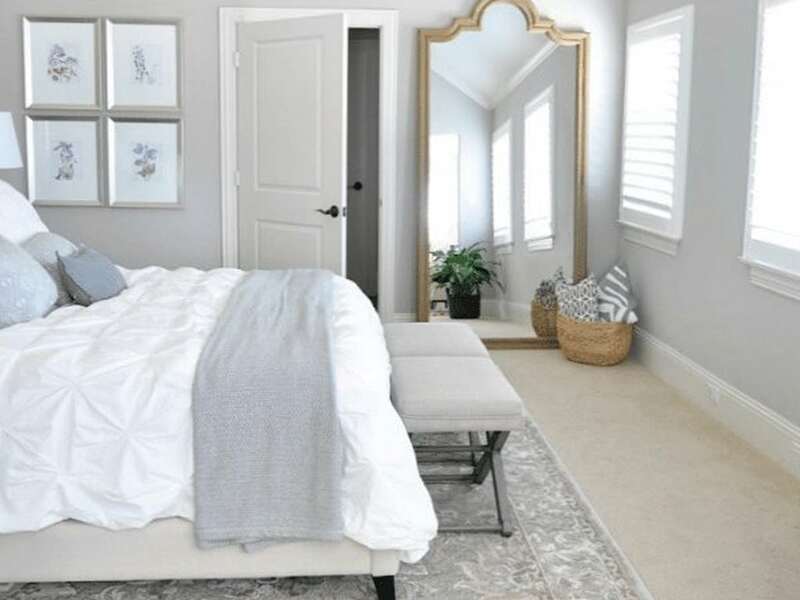 I love Anew Gray in the master bedroom pictured below. It’s perfect with the white trim for some contrast, along with the dreamy white duvet for the bedding. I specify Repose Gray in spaces that have warmer selections (like honey-oak cabinets and/or floors) that clients want to keep, but tone down and update. The undertone in Repose Gray appears as a gray-blue and tones down the yellow-golden color in honey oak selections. Repose Gray is fresh and crisp and gives spaces a clean and updated feel. Since it has a slight blue undertone and is cooler, I avoid specifying this color if my clients aren’t a fan of blue. This home pictured below is one of my favorite spaces I’ve seen painted in Repose Gray. It creates a soft and sophisticated feel and works perfectly with the white cabinetry and the monochromatic furnishings. So, if you are in the same boat as most of my clients that are trying to update their traditional tan or beige home to a fresher updated feel, consider some of these top paint color options. I always recommend testing a large painted sample first to see how it looks in your space. If making the final decision is still an issue and you need a professional opinion, please reach out to hire me for an Interior Color Consultation. It is what I have a passion for and it is truly worth it to get it right the first time. There are so many factors when finding the right color and coordinating undertones with your current selections can be tough. Hiring a painter is not cheap and you definitely don’t want to have to pay them twice to repaint a color mistake! 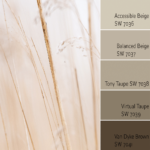 I would love to hear from you if you have any of these colors in your home or if you are looking for help transitioning your home with one of my top 5 SW neutrals. So comment below, follow me on social media or visit my shop and get started with a consultation today! Follow me on social media for more color ideas and inspiration! 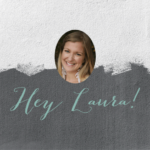 Hey Laura! Will Essential Gray work with all this Blue? 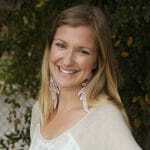 30 Cabinet Colors that will Rejuvenate your Kitchen Color Review for Repose Gray Hey Laura! Help me Transition from Beige to Gray! Thank you for reaching out! Since you tend to gravitate towards warmer neutrals, I would try Accessible Beige (or Balanced Beige if you want to go a bit darker). They would both coordinate well with Comfort Gray in the adjacent space. If you are still having trouble making your final decision, I would love to help through an Interior Color Consultation! Keep me posted on what you decide! Thanks, Joann! I bought a sample container of Balanced Beige today and I think it will work perfectly! Thanks for the suggestion. It is a nice update to the whole wheat we used to use in another house. I really like the dark trim. Would you recommend accessible beige for walls and balanced beige or tony taupe for the trim and baseboards? For a bit more contrast, I would go with Tony Taupe. By using Accessible Beige and Balanced Beige it will be hard to tell the difference between the two. Keep me posted on what you decide! Hello. Most of my home is revere pewter and I want to paint my hallway something light, bright but not just white. My entryway is narrow with not a lot of white. What do you suggest? Perfect post! I am in the middle of this very dilemma right now. Our house was built 2012 full of Kilim beige (orange/yellow beige) cream marfil marble fire place surround ( orange), Hunter Douglas power operated blinds in two story great room on windows on each side of fire place also beige. 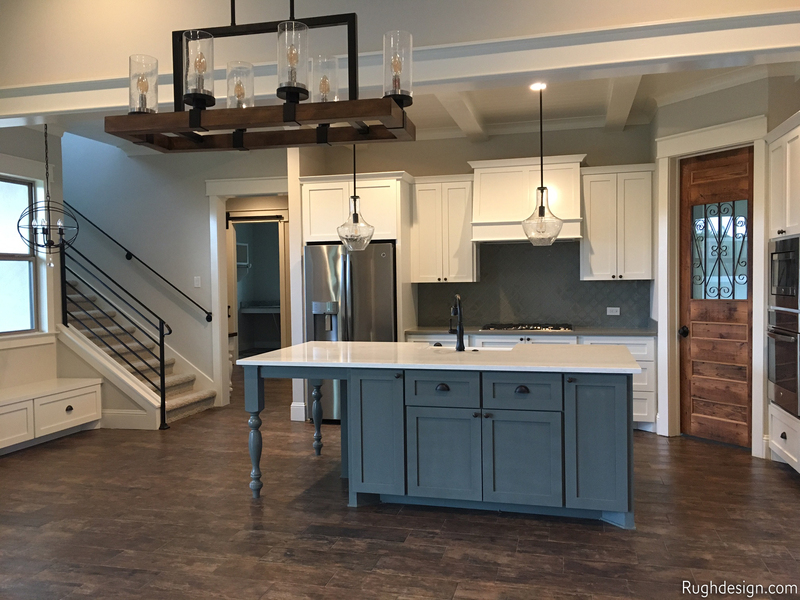 It’s an open floor plan that opens directly into breakfast room and kitchen, Gold tone hickory wood floors, brown/white/black/ some warm tones in granite, backsplash Tuscan/travertine look. Ugh!!! I’ve tried 20 types of grays, both Benjamin Moore and Sherwin Williams. Agreeable gray is nice, but washes out I. Two story great room which is west facing with full wall of windows. We tried 125% to deepen it, but not enough. Repose is too bluish-makes warm colors look more orange/warm and washes out with sun. Collonade in the quart size sample looked good in great room, but when it was made in the gallon, the color was far different than the quart sample. They used black and raw umber in the quart, but mixed black, maroon and deep gold. It came out much darker and reddish brown. I just want a deeper version of agreeabke gray. Anew gray is too dark. It looks brown. So frustrating. I haven’t tried the other colors you mentioned yet, because wanted to avoid anything that looks too beige or anything like Kilim and don’t want brown. A lightened version of Collonade or deepened version of Agreeable gray is what I’m after. Just hard to know how to tweak the formulas beyond the 25% steps I’ve tried. Suggestions are appreciated-paint store employees and I are on first name basis. Their color specialist (Sherwin Williams) came out, recommended the Collonade and an accent wall in Pussywillow. The Pussywillow was/is way way too dark and cast a green cast. We added several ounces of white to it. It’s better, but still too cool. I had looked at accessible beige and weirdly beige as my next options. Just makes me sick to go back to a bland beige. Wasn’t sure about perfect greige. Exhausted trying to solve this dilemma. Thanks for your post! Repose gray transformed our home from dark and dated to posh — refreshing! I used it in every room and it works perfectly with Ultra white woodwork and trim and the dark Mohawk laminate flooring we chose. Yay! I’m so glad. Repose Gray is so gorgeous and is definitely one of my top personal favorites. 🙂 Thank you for chiming in! I have a north facing living room with one large window. I want a “warm” grey so I thought I’d be going for repose grey or colonnade grey. Repose is looking too tan, and colonnade is looking ok so far but like it could pull green. The SW employee suggested ZIRCON. I’m liking it so far but I’m scared it will pull blue as a commenter mentioned on another post of yours. Do you know if it has a tendency to do so??? I do NOT want green or blue showing up! Zircon definitely has a blue undertone, so if you would like a warm gray, try Agreeable Gray. If you are still having trouble, I would love to help you through an Interior Color Consultation to find the right color for your space! Hi, you mentioned that Repose Gray is specified for homes with honey oak cabinets. How do the other four colors work with the honey oak color? Repose Gray works so well because the slight blue undertone helps to tone down the more golden tones in the honey oak. The other colors are warm enough to compliment the honey oak, they will just keep the feel warmer. It will also depend on your other fixed elements like the countertops and backsplash. If you are trying to nail down the right color for your space, I would love to help through an Interior Color Consultation. Let me know if that would work for you! I would love to help you through a Color Consultation! You can go to my Shop and sign up there. I look forward to hopefully getting to work with you soon! Great post! Thank you for sharing! Our trim/doors/ceiling are SW Navajo White and we have antique white kitchen cabinets and a high two story floor to ceiling white/off white stone fireplace. Would any of the greys/neutrals you mention go with SW Navajo White or do you recommend repainting trim/doors/ceiling? Thanks, Sonya! Accessible Beige or Balanced Beige could work with Navajo White, but if you are looking for a more crisp look with some contrast, I would consider re-painting your trim and cabinets to a brighter off-white, like Alabaster or Extra White. Let me know if I can help further through an Interior Color Consultation! Hi, I am so confused about Gray colors. Does Essential Gray have blue in it because when I paint a sample on the wall it looks blue to me. I have been told to try Proper Gray or Wordly Gray. It is a kitchen with a lot of white cabinets and the granite is dark and the back splash is the glass and stone tiles small rectangle pieces. 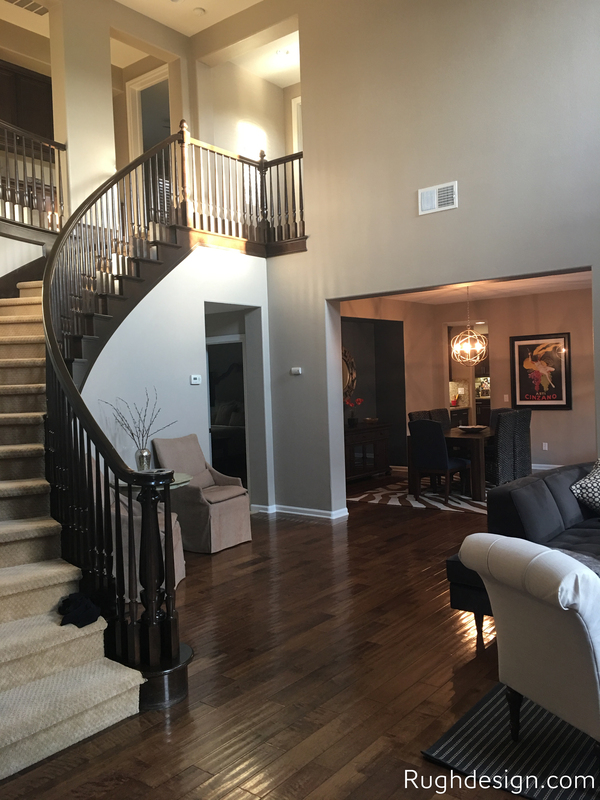 I am painting a great room and a large foyer that goes up to floors. Grayish was suggested for the great room and Malabar or antler velvet suggested for hall and foyer. Told this was all the same color palet. Any suggestions for my confusion. Thanks so much. I’m so sorry for all of the confusion! I know grays can be tricky. 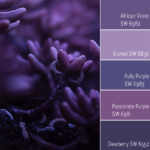 Essential Gray and Proper Gray actually have a lavender undertone, so I honestly try to steer clear of using these grays unless the goal for the space is to have a purple undertone. Worldly Gray is a good “true” gray that I like to use and have seen look gorgeous in interiors. I have a few other go-to grays that I also like to use and would love to help you nail down the perfect color for your kitchen, and the adjoining spaces in your home, through an Interior Color Consultation. Thank you so much! That makes me happy. 🙂 City Loft could work! Test out a sample to see how it looks in your lighting. I also have a few other colors in mind that will could work! Let me know if I can help through an Interior Color Consultation. I can view pictures of your space and find the right color for your kitchen. Hi I’m looking at city loft as well. I would like to use it for my whole first floor. My family room is repose gray but I was looking for something lighter. Do you like city loft? What advice do you have when trying to decide between Accessible Beige and Balanced Beige? Also, would Alabaster cabinets clash with Extra White trim? Great question! I tend to use Accessible Beige in spaces that don’t have as much natural lighting or in homes that are going for more of a soft feel. Balanced Beige is great in areas that can handle a bit more color (open areas or rooms that have more natural light). Sometimes either can work and it comes down to personal preference with my clients that like softer/lighter colors or prefer a bit more contrast or more of a saturated color. I have enjoyed reading all of these posts!! We built our house in 2005 …used the “Tuscan” design trend as you mentioned. We have slate floors in my kitchen with Westminister Gold walls and dark stained cabinets. We are trying to get rid of all the yellow walls in our house and lighten up all of the Browns, golds, reds etc. The trim in my house is Benjamin Moore Monterey White. I’ve tried Carrington Beige on the walls but it looks too white/grey to us against our dark cabinets. We do have lots of big widows that give lots of light. Would there be a better neutral to replace all the yellow? Hi there ! would love a suggestion for our new home. Big open windows to the north. Sliding doors in dining room on the east sliding doors in great room to the west. A lot do light. I personally love repose but my husband is a Southwest kind of guy. We have a bump out entry way I wanna do as an accent color. He likes perfect beige and that is entirely 2 dark for my whole house. I don’t like the yellow in accessible. I am thinking peacock plume for the entry way or peppercorn. 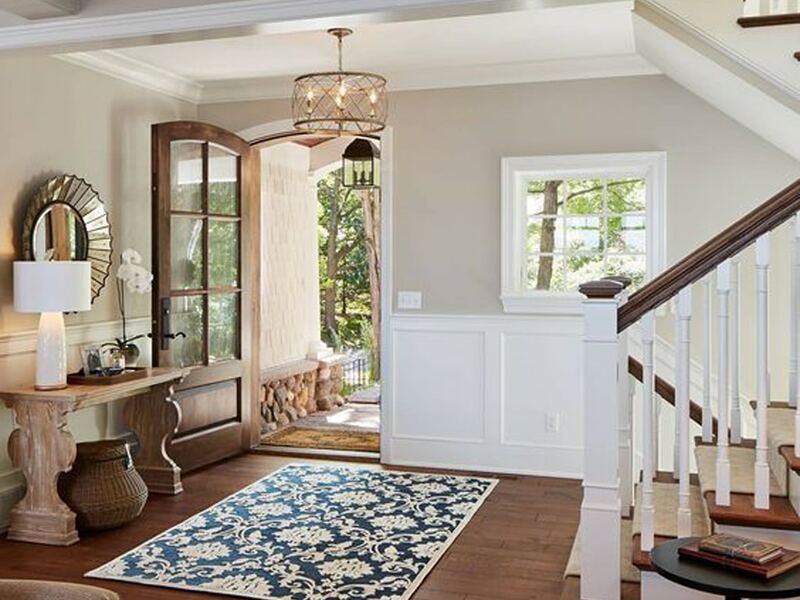 What are your thoughts on balanced for a compromise between accessible and perfect, and thoughts on the entry way with peacock plume or peppercorn ? Thanks for reaching out! Peppercorn can get dark, so I would test it out with a sample first. Peacock Plum would be really pretty too! I too have a “Tuscan” home full of Richmond Gold. I see you really like Balanced Beige, but how do you feel about Barcelona Beige? Balanced Beige seems Gray to me and I don’t want any gray. We have brown leather sofas and medium to dark wood pieces. My kitchen cabinets are Alder and tend to be a warm medium brown with maybe a slight smidge of redish gold to them, granite is green. We have light tanish carpeting and tile. The home has high ceilings and lots of Windows. The color will be next to BM Richmond Gray (that is really green, not Gray). Thanks for this great post!! So so helpful!! Can you give some color suggestions for ceiling, trim and cabinets with these colors? I’m always confused on what color and finish to paint the ceiling. Any suggestions would be appreciated. Thank you! The trim, cabinet and ceiling colors can very from a brighter white to a more creamy white and there are a several options for these 5 colors depending on the other selections in your home. 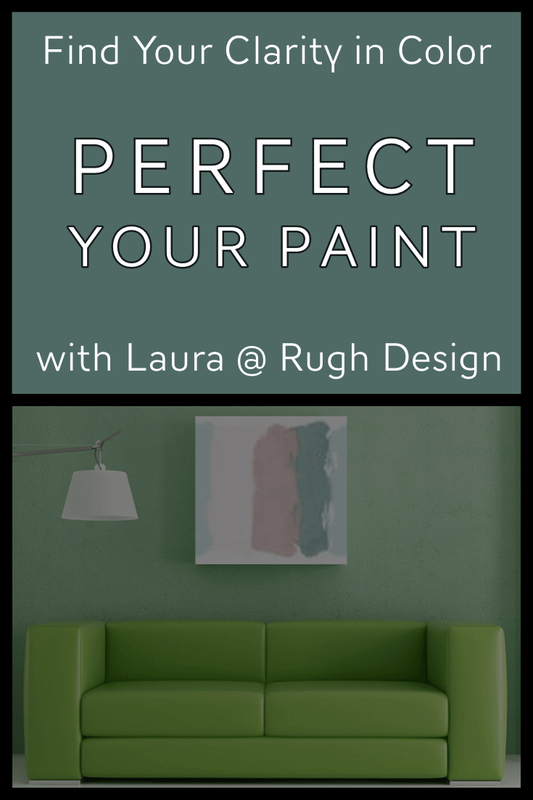 I would love to help you find the right color through an Interior Color Consultation! Your post was right on time for me. I have the Tuscan look as well that I’m trying to transition from. I’m debating on Accessible Beige and Balanced Beige. Your post helped me narrow down those 2 colors from all the other Sherwin Williams neutrals. I’m going to get samples of both and try them out. Now to figure out changes to my light fixtures and other decor items from the Tuscan decade, Thanks you! We are building a new rustic ranch home on wooded acres and would like to bring greens and beiges into our home. Do you have suggestions for greens and beiges that complement each other? Thanks so much! What darker warm gray works with accessible beige. There are several options for warmer grays that compliment Accessible Beige. My favorites are grays with a slight blue undertone. Let me know what you decide or if you need more help! I love Repose Gray. Pained our three bedrooms this color. I’m not happy with our ceiling paint though. We used flat white ceiling paint from SW called eminence. Looks blue to me and is streaky. Can you recommend a white ceiling paint to be used with Repose Gray please? My condo has great east morning light but goes dark in the afternoon. Floors are a light blonde/brown/gray in color (coerce laminate/ Ivory Coast), kitchen is open to LR, granite is St. Cecelia. Cabinets are light maple (hate them) and furniture is Room and Board maple, sofa is dark brown. Iilim beige is too dark and I probably do want to get away from beige, but I don’t want to go gray because I worry the maple will turn even more orange. I will us an oriental rug with reds and blues. I did just paint the lanai Useful Gray (or is that Agreeable Gray?) Please help! I totally understand how hard it can be to find the right wall color to work with your current selections. I can help best through an Interior Color Consultation so I can view pictures of your space and make the best color choice for your space. I hope to hear from you soon! Hi, we have SW Believable Buff in upstairs hallway down stairwell through the downstairs hallway. Would Repose Gray transition well then for the downstairs rooms? Do these 2 colors transition well together in general? would agreeable gray work with golden oak cabinets and trim? my floors are pergo laminate in the oak color as well. I’m really struggling to find the right color for my main level. I’m transitioning from the burgundy and gold phase and hobby is not about to change out the oak. Help! Thanks for reaching out! Try out a sample to see how it looks in your lighting. I tend to go for the grays that have a slight hint of blue or green to contrast against golden oak. I would love to help you find the right paint color through a Color Consultation if you still need help! I’m struggling because some of our house selections–particularly the Santa Cecilia granite in our kitchen–are very warm and tan. The new gray color trend doesn’t seem to go with the countertop at all. We tried painting samples of the accessible beige, but it clashes with the tan of the counter. We keep coming back to the Kilim Beige color, but I’m nervous about picking a color that will look dated (like the Tuscan reference in the article). With the white trim and white cabinets will the Kilim beige look nice with the Santa Cecilia countertop? Something else you’d recommend? Looking for a paint for walls. My cabinets were just painted with SW Toque White. I have wood base molding (kind of oak color) and a backsplash that has beige tones. My granite is dark. My floor plan is that the kitchen opens into the family room without a dividing wall. Right now the walls are painted with SW Latte and corresponding colors. Looking for a gray to paint the kitchen – family room. Would like a gray that has beige tones – can you suggest anything? Curious what paint color you would recommend to go with white cabinets and Santa Cecilia countertops? Hi! These posts have been so useful! We are moving into an 130 year old house with golden oak floors on the entire 2500 sq ft first floor. Our kitchen cabinets will be painted a version of white, the counter tops are a mix of white, grey, and warm tones. The house sits facing east. There are many windows and plenty of light. We are planning on painting all the first floor rooms (sunroom, den, dining room, living room, family room, breakfast nook, kitchen and powder room) in one of the gray families: agreeable gray, repose gray, or useful gray. Which one will downplay the golden oak floors the most. I don’t like blue tones on the wall, but I want the floors to look as less golden as possible. My painter decided he’s ready to paint and I’m under the gun. No time to do an online consultation. Im painting foyer and stairway. I love agreeable gray but my great room walls are Nantucket Dune. The great room has very high cathedral ceilings so I’m not ready to tackle that paint job yet. The walls would actually meet at one corner. I am also considering Accessible Beige but I like Agreeable Gray better. Do you think this could work? Help! I went and got samples of balanced beige and accessible beige based on your blog post. I am looking for a griege, because I have tan/beige fixtures. When I put them on the walls they are both very dark colors. Balanced beige looks like a brown not griege. I am trying to update the room and make as appealing as possible in case I decide to sell or rent. I almost think Sherwin Williams mixed the colors wrong based on your photos. Any suggestions? That can happen with paint in some lighting! Also, the samples are not always the most accurate. I suggest getting a small quart mixed up and trying that out. If it still looks off, you may want to try another color that is more greige, but still works with your fixtures. Keep me posted and let me know if I can help you through a Color Consultation. I can view your selections and help you find the right color! thank you for all the info! i have been contemplating paint colors for a long time. i am wondering if i can get your expert opinion? my house doesn’t get a lot of natural light, except the kitchen in the morning. i think i am going to go with agreeable gray in the kitchen at 25% lighter. would it be ok to paint the foyer (that you can see from the kitchen) and living room alabaster or white dove (bm)? i don’t want the colors to clash and i don’t want them to appear too similar. in that case, i don’t know if I should just do agreeable gray throughout the kitchen and living room. would love your thoughts! Thank you for reaching out! If you can, get a test sample to see how the Agreeable Gray lightened looks in your home. It’s possible that it’s too light! Also, I typically like to paint all open areas the same color. However, Alabaster won’t clash with Agreeable Gray if there is a good stopping point in your foyer from the kitchen/living room. Let me know what you end up deciding! I live in a manufactured home that has dark cabinets and low ceilings. There is a lot of natural light. The floors are bamboo. I love the paint colors above. When we first moved into this house, I painted the walls, ceilings, and trim all a wheat/yellow color. It’s time to update! What color would you suggest for the walls, ceiling, and trim? Thank you for reaching out! I sent you an email with a discount on my Interior Color Consultation packages. Would love to be your color consultant! Thanks, Bernadette! I hope to hear from you soon! I am looking to use repose gray in our master bath, however, I am not sure which white trim to go with. We have a beautiful white vanity that looks a bit creamy / yellow in some lights, so I am looking to downplay any yellow tones and blend it with all of our other white fixtures…toilet, shower, etc… any input? thanks so much! Thank you so much, Laura! I am definitely going for a spa-like feel!! Do you have a favorite go to trim that matches that description?!? I would love to be your color consultant! Please check out my Interior Color Consultation and choose the Trim/Cabinet package in my shop. Thanks for reaching out! I looked at Savoury Beige by Valspar and it looks similar to Kilim Beige and like it might have a slight peachy undertone. Test out a few other samples next to it for comparison and see how it looks in your lighting. Let me know how it ends up! I’m debating on a neutral to paint in my windowless laundry and attached powder bath. I want to paint the cabinets in a blue/green shade. I was thinking SW Creamy or do you think Repose Gray would be better? Thank you for reaching out! I love the idea of using Creamy on your walls, especially in your laundry room and attached powder that don’t have windows/natural daylight. Creamy is my favorite cream because it doesn’t get a noticeable yellow undertone. It will pair well with a blue-green cabinet color too, like Quietude or Oyster Bay. Keep me posted on your project and send pictures when you finish if you can! I can’t say how excited I am that I found your post! This is exactly my dilemma. We live in a 1970’s all brick ranch house that doesn’t get much natural light. My small kitchen (w/maple and chocolate glaze cabinets) is Alabaster and like the light airyness. I have been through several “Greige” colors for my living/dining room and hallway, but haven’t found the right “warm” greige (not wanting straight-up grey). i really want a soft beige with a hint of grey. I have so many paint samples around, I feel like I could open a pop-up paint store! Lol! I’ve tried Revere Pewter (it was too dark and grey which cast a coolness), so I just painted the living room Accessible Beige. But once again, it looks grey instead of a warm greige and is looking too cool. Ugh!! Help!! Does a warm greige even exist or should I start from scratch? Any suggestions would be appreciated. Thanks so much! I’m sorry that it has been such a challenge to find the right paint color. There are warm greiges, but it sounds like your lighting is casting a cooler light and causing the colors to go more gray. If Accessible Beige is not working, one color that I like is Natural Tan. It has more beige to it, but still has a hint of a taupe/greige. Test out a sample and see how it looks. Softer Tan is one more to try. It is definitely more of of a beige, but because of your lighting, it could be just perfect. Keep me in the loop of your progress. I would love to hear what color you settle on! Hi I have antique white furniture (SW), what gray would you recommend for the wall paint? Hi, I have zircon everywhere in my house.My trim and doors were light bage and I’m turning them to white(no added color). Since we turned trim white my walls looks more gray then blue but the only problem is at night time esp. in my bedroom I don’t like the brightness on my door. I use dim light in my room but the semi-gloss white reflects light, which is making it more brighter.I like soft colors. Any ideas? should I get some tint for bedroom door? Also what color looks better for window seats?